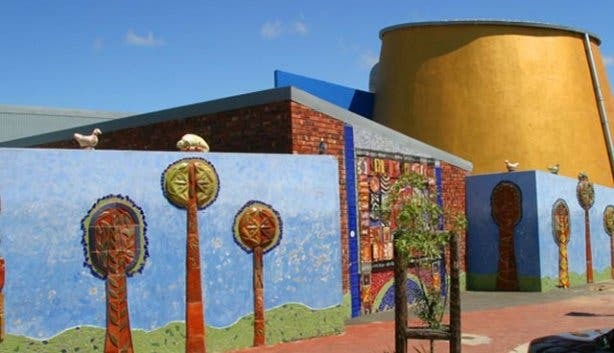 Guga Sthebe Arts & Culture Centre in the Langa Township, 15km - 20km from Cape Town, is one of the highlights during a township tour. Guga Sthebe, housed in a brightly coloured building, is dedicated to the empowerment of the people of Langa and improving their socio-economical situation. One of the focuses is unemployment. This is very important, as 60% of the adults are unemployed. This does not mean that these jobless people don't work. Many work in the informal economy, either by running a Spaza shop (a township shop ran from people's homes) or by street vending. Nevertheless, only a minority in Langa has a contractual, structural job. Guga Sthebe aims for change. Their services include accounting services for small entrepreneurs, secretarial services, and other facilities that enable people to start a business and provide for themselves. In their strategy to improve life in the township of Langa from Guga Sthebe focuses on Arts & Culture. Here people are trained in several art forms as metal work and Pottery. There is a community theatre and people can join dance, arts & craft lessons, traditional dancing, choir training, music and poetry, and regular exhibitions expressing local and national art activities. There are exhibition areas and art studios, a resource centre, storeroom facilities, a retail facility for arts and crafts, a workshop metal work and a workshop pottery, and much more. Guga Sthebe is one of the highlights of the township tours in Langa & Guguletu organised by Township Tour operators that promotes sustainable and responsible (township) tourism.